A large and expectant audience of members and visitors gathered in the Parkhouse Centre for Rupert Kirkwood’s talk entitled “Up the Creek” at the November Open Meeting of Bude & District U3A. All anticipation was rewarded as Rupert’s lively and fluent delivery coupled with his amazing still photographs and video clips kept everyone enthralled. The journey he described followed the route of the South West Coast path, starting from Poole, but all from a watery viewpoint. Walking the Path covers about 630 miles, but following the coast and including the river estuaries and creeks adds up to twice that. 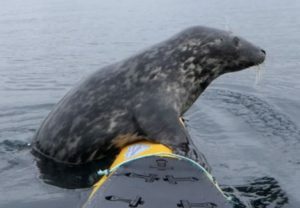 Travelling almost silently in his kayak enables Rupert to get really close to wildlife without disturbing or distressing them. Some of his results were breath-taking, some humorous and others exceptional. Dolphin, whale, tuna, shark, jellyfish seal and otter all had their moments. Of the dozens of birds, the most appealing was a Little Auk, a species normally found only in Arctic waters. This one was apparently a little weary of the sea so it decided to land on his kayak and take a peaceful snooze for a while. Through it all, Rupert revealed a huge respect not only for Nature and all wild life, but also for the sea itself, always aware of tides, currents, wind and weather. He often travels quite far out to sea on his voyages and claims the doubtful honour of being the only kayak to have been stopped by the UK Border Force. On one occasion he came close to some huge racing yachts during the Fastnet Race, — a modern David to their Goliaths — but such encounters are fortunately rare; the Natural World is always much more rewarding. Rupert’s talk was rounded off by several questions from the floor and he was thanked by the Speaker Secretary, Denni Clarke.